The Buddha statue is one of the main art forms in Laotian culture. Graceful figures blend with the abundant foliage and with rivers, mountains and temples into a landscape that enchants every visitor. Laotians developed their own style of Buddha sculpture shortly after they formed their Lan Xang kingdom in the 14th century. Please come inside and see a little magic. Lan Xang’s founder, Fa Ngum, was raised at the Khmer court, and he brought a Buddha statue from there when he trekked north, defeated local lords and established his kingdom in Luang Prabang. His son and successor, Sam Saentai, strengthened Buddhist practices by founding monasteries. But he followed a different cultural tradition. 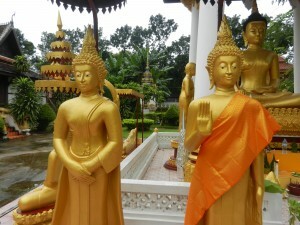 He brought the Sukhothai Buddha style into Laos. 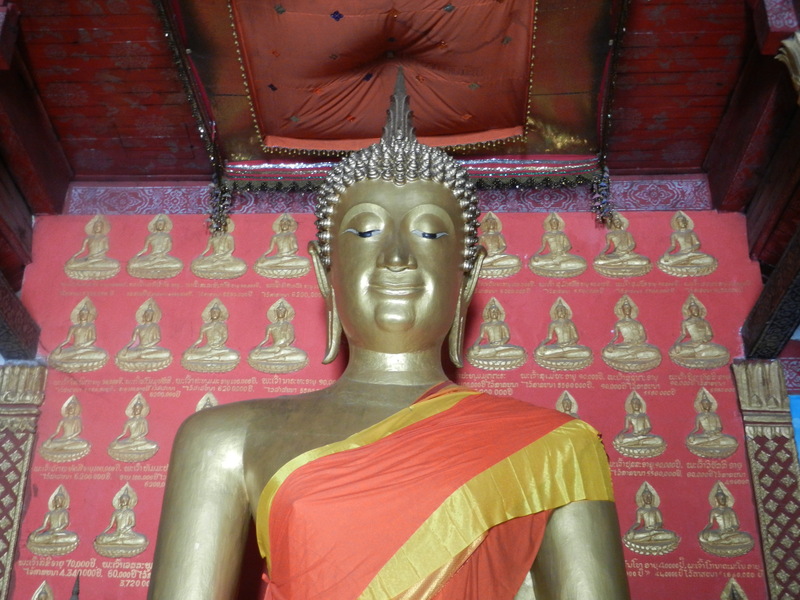 The above statue, in Luang Prabang’s Wat Monorom, was cast from bronze in the 1370’s–during his reign. Luang Prabang’s elites built Wat Monorom to house Sam Saentai’s ashes, and this 20-foot-high statue was installed there. The Sukhothai style was developing then, and it became Laos’ most influential. This is no surprise because the Khmer empire was declining in the 14th century–it had lost a lot of land to the growing Thai states, including Sukhothai. Laotians comprise one of the Tai ethnic groups (it’s spelled “Tai” to refer to people of Tai descent who live outside of Thailand and who don’t consider themselves to be Thai nationals). They had a much easier time communicating with Thai states because their languages were similar. 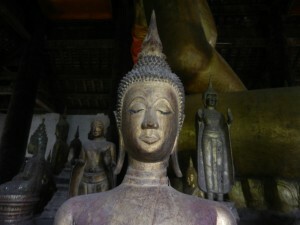 And people in northern Thailand resonated more with the Sukhothai statue’s forms, which gracefully curve. 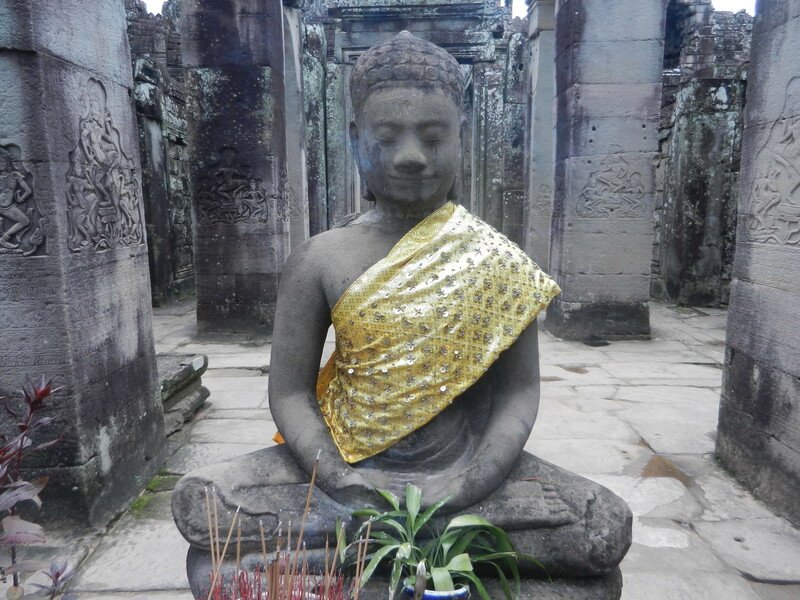 Khmer Buddhas, like the above one at the Bayon at Angkor, are usually more squarish and sturdy looking. They project the unmovable strength of the elites who built and ran this great empire. But Laotians did their own thing. 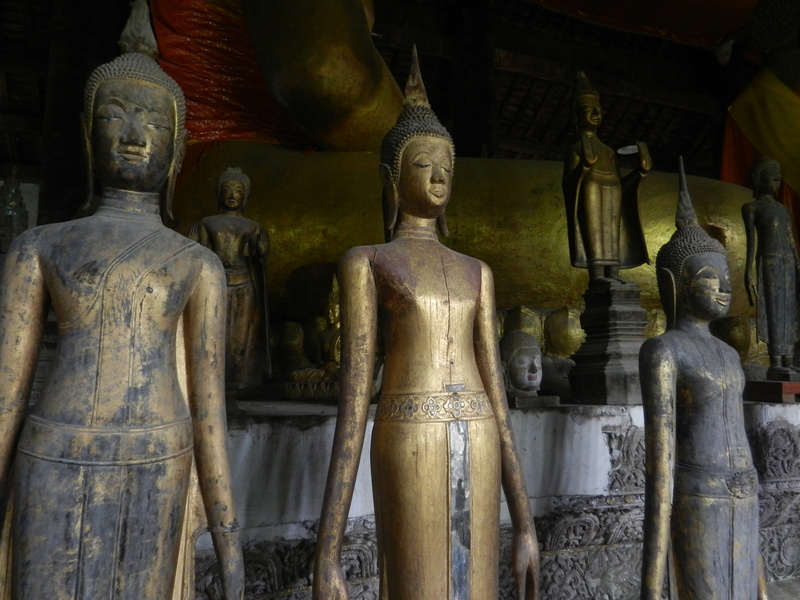 They varied the Sukhothai Buddha’s forms a bit. Like these novice monks taking a break from their studies in Luang Prabang, a lot of Laotians are direct. Many people in Thailand avoid showing intense emotions. On average, I’ve found Laotians more willing to show how they really feel. The husband and wife who own a Laotian restaurant I recently ate in snapped at each other right in front of their customers. 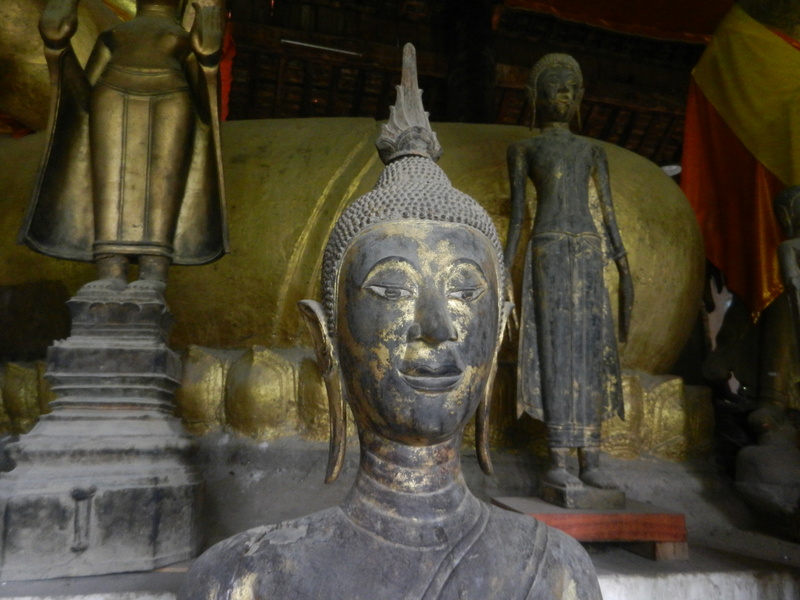 All of these four photos are from another one of Luang Prabang’s oldest wats, Wat Visoun. 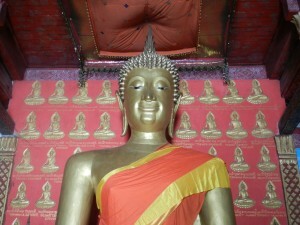 The statue in Wat Monorom was made when the Sukhothai form was developing. When it matured in the 15th century, it became pure elegance. It’s beautiful, but it’s so idealized that it seems to be in its own rarefied world. 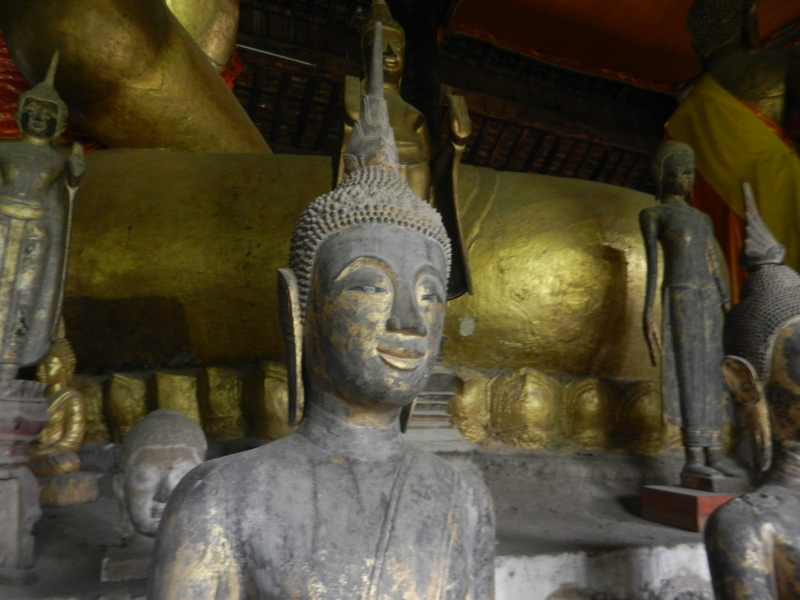 Most Laotian Buddha statues are more folksy. They still have the Sukhothai statue’s elongated forms, curving features and soft smiles–they’re still gentle, so they won’t crank at anyone in a restaurant. But they all look more casual and a bit quirky. They’re graceful, but not perfect. The influences from folk art allow ordinary people to feel that they’ll hear their prayers. 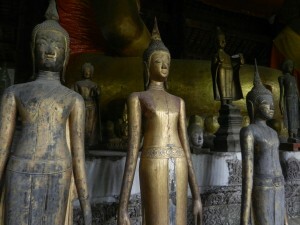 The above statues are in a pose that’s particularly popular in Laos. They’re calling for rain. Laotian legends say that the people were suffering when a drought had settled in. The Buddha used his merit and powers to ask the spirits in nature for rain so the people could grow enough food to eat. Laotian art has a lot of human sides. Communities have bonded closely in this land of towering mountains and small valleys. People, art, and nature in Laos bestow an infinite variety of delights on anyone who travels there.